With every passing promotional event I find myself becoming more and more excited by the idea of the FIA Formula E Championship. The series, slated to make its debut in a city near you next year, will feature cars powered exclusively by electric energy. While it is clear that electric and hybrid cars represent the future of everyday motoring, the case for a racing series based on those same technologies is perhaps less apparent. Formula E has been conceived to promote the use of sustainable vehicles and organisers behind the championship aim to do that by bringing exhilarating electric racing to the people. The line up of contributors to the series reads like a who's who of Formula 1. Alongside test driver Di Grassi, Jaime Alguersuari, Vitantonio Liuzzi and Bruno Senna all turned up for a recent press event. Additionally McLaren have been confirmed as electronics supplier, while ex-F1 tyre supplier Michelin will provide the requisite rubber. Word has it that Renault might be interested in participating, while fans of the old BAR F1 team will likely remember team principal of Dave Richards, well he's registered his interest too. You will recognise the names of all of the proposed races too. Formula E won't be bothering itself with those impossible to attend race tracks in the middle of nowhere, locations so far selected include the cities of London, Rome, Miami, Los Angeles and Rio de Janeiro. The championship can do this because the audible footprint of their racing car is miniscule compared to other forms of motorsport, in fact the cars are almost adorably silent. As if to prove that very point, a fortnight ago Lucas di Grassi rolled up on the streets of Los Angeles, accompanied by the perpetually cheerful Bibendum, to perform silent doughnuts for assembled onlookers. So what do the drivers make of such a significant reduction in volume? Lucas was excited by the new avenues of feedback the new engines open up. For the first time ever, a driver can hear what the car is doing. What the suspension is doing, when the brakes squeak and the little details you don't get with a combustion engine. It's a special feeling to drive a high performance electric car. With a 20-driver grid planned for the first season expect to see even more familiar names appear. Nicolas Prost, son of F1 world champion Alain, is another one and he is extremely positive about the potential of the series. I think this might attract younger people maybe more families. People who are scared by the noise of motorsport. I think it will surprise a lot of people. Traditional race tracks around the world are coming under ever more political, social and financial pressure. Last year's British Grand Prix weekend was marred by a public transport disaster that saw fans stuck in queues for up to nine hours before being dissuaded from attending qualifying. Conversely the historic Leicestershire track of Mallory Park has become the latest in a long line of circuits to face the ire of local residents looking for peace and quiet in their hectic lives. Here at Sidepodcast we've long been fans of Red Bull's ice cross downhill skating championship Crashed Ice - a competition that erects a custom built ski slope in the centre of some of the world's biggest cities and regularly sees the attendance of over 100,000 fans. It manages this despite being a largely niche sporting event. By comparison, transporting thousands of fans to a field in the middle of nowhere seems positively antiquated. 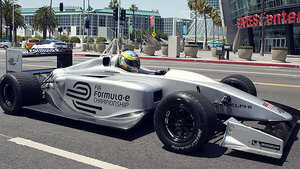 There is still a long way to go before Formula E proves itself a contender in the motorsport world, in the meantime enjoy this promo video from the LA event.